By 2050, Earth will be home to nine billion people. The planet’s resources are stretched to breaking point today. Add another three billion on top of the existing population and the future begins to look less than utopian. Among the resources most stretched will be food. There will be fewer fish in the ocean as a result of decades of overfishing. On top of that, water will be scarce due to higher demand and the effects of climate change, which in turn has an enormous impact on food production. We don’t just drink the stuff, we also use massive quantities of water to produce food and raise livestock. We won’t be able to sustain current farming practices. If we want food security we need to rethink our entire approach, by looking for alternative food sources and making food production more efficient. Cricket flour is also high in protein, fat, fibre, vitamins and minerals, and low in saturated fat, and it requires much less water to produce than other sources of protein such as chicken or beef. This makes insects a particularly interesting nutritional supplement for people in developing countries, especially children. This was a new type of flour that neither me nor my mentors had seen or used before. We had to investigate the molecular structure before we could start developing any products. 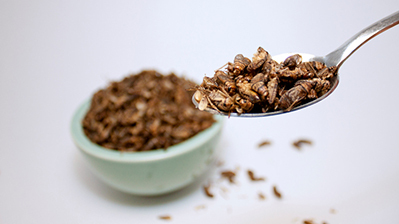 The commercial appeal of insect-based food products is on the rise in developed countries, especially in the UK, with a number of companies now selling insect-based products. LSBU was approached by one of them, which was looking for expert help to expand its product range. It was paired up with Devon Petrie, an LSBU graduate in Baking Technology Management, to carry out the testing and development. It was an exciting challenge for Devon. “This was a new type of flour that neither me nor my mentors had seen or used before. We had to investigate the molecular structure before we could start developing any products." Devon found that a cricket flour mix doesn’t have the same molecular make-up as normal bread mixture: “It seemed to act the same as additional bran and therefore the molecular structure alters.” This meant that additional gluten had to be added to the dough to form the bread products. “Once we had analysed the flour, the product development was a straightforward process and allowed us to create products for the market,” remarks Devon. In the end, Devon created a flour mix that is in the process of being commercialised by the company, which was delighted with the results and is in early talks with the University about a second collaboration to develop more insect-based foods. Devon has now become an expert in the area and he is using his new knowledge of insect-based products to study for a PhD focusing on insect-based products. He is also hoping to be able to one day use the experience gained at LSBU to help eradicate hunger in his homeland, Zimbabwe.